These are effective workout programs for women! There are so many reasons why today is a great day to start. Soak up over 12 years of training knowledge and fitness advice from Coach Julie. Develop Your Glutes! This program offers workout programs you can do at home, at the gym, at the beach or even in a hotel room! Coach Julie offers this growing resource for fitness enthusiasts who always want to try something new. The workouts include HD video tutorials to make learning new movements fun and easy! Watch a few video examples of Coach Julie’s Glute Exercises! Try Coach Julie's Glute Exercises Free for 7 Days Now! Cut Body Fat! 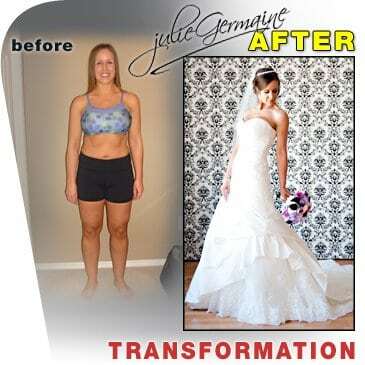 Do you want to learn how Coach Julie cuts bodyfat quickly without losing her shape? Over-dieting can cause muscle loss – don’t make that mistake! This program is made for women who want an easy-to-follow diet that allows for some indulgences and a manageable workout regime. This detailed guide will help you understand your body and maintain your ideal weight. Watch a Video Preview of the Member’s Area! Join Coach Julie's Program Now! Workouts Include Fun, New Booty-Building Exercises to Challenge You! Become a Member Today, No Risk! A fast and effective way to tighten your core and free yourself from endless dieting! Weight training is part of my programs and having access to a fully equipped gym adds more versatility to your workout. If you have a home gym and are knowledgeable about exercise, you can make substitutions to the workouts. There are also additional home gym workouts available for purchase that compliment the program. I prefer to call them Treat Meals… the catch is that you have to EARN these bonuses! I will help you understand healthy eating and want you to learn to enjoy healthy foods so that you can splurge on your favs! Moderation is key. After popular demand, I will be adding advice on supplements to aid in muscle recovery, fat loss and more in the members section very soon! Yes, the programs outline the recommended duration of cardio per day and overall throughout the week. The members area will also have more information regarding type of cardio based on individual circumstances. Buy The 5 Week Slim Now and Get Lifetime Access! Some Amazing Sweat With Julie Success Stories! Coach Julie Germaine is a fitness expert who has devoted over a decade to motivating people just like you to make their health a priority! Develop Your Glutes! Monthly workout guide to build fantastic legs and finally get that 6-pack you’ve always wanted! Cut Body Fat! Access mobile-friendly workouts, easy-to-understand diet and helpful fitness tips to shed weight without losing muscle. Sign up for free advice from Coach Julie Germaine!